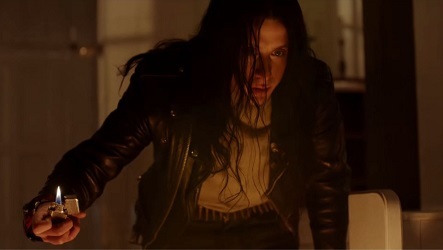 Based on “truth, lies and what actually happened,” director Jonas Åkerlund’s Lords of Chaos, adapted by Dennis Magnusson and Åkerlund from Michael Moynihan and Didrik Søderlinds book of the same name exploring the Scandinavian black metal scene of the late eighties and early nineties was never going to be subtle or without controversy. What is indisputable is that two of the principals involved died by violence, singer Per “Dead” Ohlin by a particularly messy and determined suicide and guitarist Øystein “Euronymous” Aarseth murdered by his former bandmate, and that another two have served time in prison for murder, bassist Kristian “Varg” Vikernes, sometimes known as Count Grishnackh, for stabbing Euronymous multiple times in his home after he claims he was attacked, and drummer Bård “Faust” Eithun who stabbed a stranger thirty-seven times. 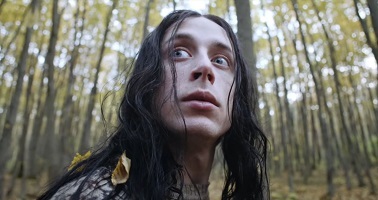 Told principally as the story of Euronymous (Castle Rock’s Rory Culkin), only twenty-five years old at the time he died, it follows him through the formation of the pioneering black metal band Mayhem and his friendship with the morbidly depressed Swedish vocalist Dead (The Nice Guys‘ Jack Kilmer) whose extreme performances raised the local profile of the band but who could not balance his life offstage. 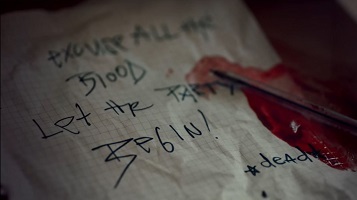 Euronymous finding Dead’s mutilated body and his apologetic suicide note, “excuse all the blood,” he proceeded to take photographs of the body before calling the authorities; the immediate future of the band derailed he opened a record store in Oslo and founded the label Deathlike Silence, operating a death metal hangout beneath stairs. Among the regular patrons was eighteen-year old Varg (The OA‘s Emory Cohen) of the one-man music project Burzum; signed to Euronymous’ label, Varg pushed for revolutionary publicity, first burning churches then suggesting bombings, those in the inner circle pushing each other to more extreme behaviour and unable to back down in front of their peers. It is over a quarter of a century since the death of Euronymous, and Lords of Chaos presents the last six years of his life from ambitious but nihilistic teenager to self-proclaimed inventor of a new sub-genre of music, the originator of Norwegian Death Metal, and on to that August evening of August 1993, Culkin presenting him as eager but overwhelmed and unable to escape from an ill-conceived vision spinning out of control. Unapologetic and aggressive, Cohen’s Varg initially seeks the endorsement of Euronymous but quickly feels he has eclipsed the former mentor who now stands in his way, a traitor to the cause he invented, and while the concert scenes capture the sense of live performance, the band and the crowd feeding off each other and pushing the other on, the violence is presented as exactly that, unflinching, brutal and without any attempt to sanitise or glamourise the event or the perpetrator. Existing in an enclave where they make their own rules and challenges for leadership must be answered, Åkerlund presents his protagonists without judgement, allowing them to damn themselves in their burgeoning modern white supremacy, echoing and reinforcing their own beliefs, teenagers calling themselves paganists and Satanists and Nazis without awareness or irony, lords of chaos only in the realm of their brick basement hideout and scurrying when the dawn breaks.